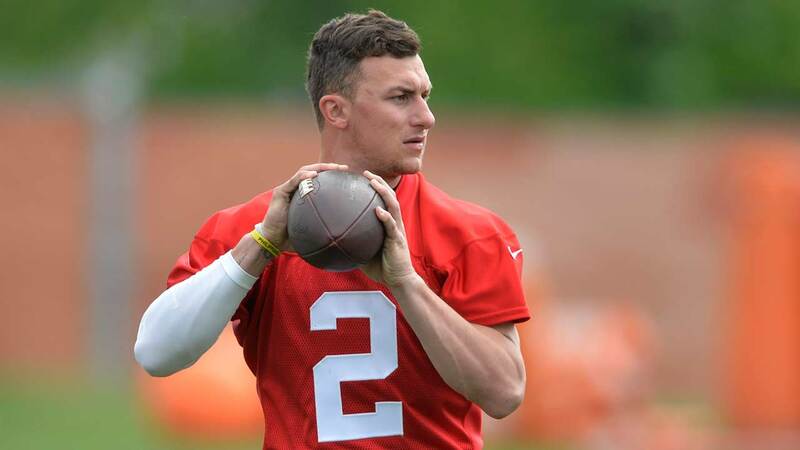 DALLAS, Texas -- Former Cleveland Browns quarterback Johnny Manziel was indicted by a grand jury on Tuesday on a misdemeanor charge stemming from a domestic violence complaint by his ex-girlfriend. The 2012 Heisman Trophy winner and Texas A&M star was accused by ex-girlfriend Colleen Crowley of hitting her and threatening to kill her during a night out on Jan. 30. Crowley said in court documents that Manziel struck her so hard that she temporarily lost hearing in one ear. The indictment accuses Manziel of striking Crowley and "forcing (her) into a vehicle and against a vehicle dashboard." Manziel faces a charge of misdemeanor assault related to family violence, which carries up to one year in jail and a $4,000 fine. Dallas police referred the case to a grand jury in February, asking the Dallas County District Attorney's Office to present the misdemeanor assault case. Manziel was cut by the Browns in March after two tumultuous seasons marked by inconsistent play and off-the-field headlines about his partying and drinking, including one stint in rehab. His future in the NFL is uncertain at best, and might be nonexistent without a second stint in treatment that two agents have demanded. The league also has tougher standards regarding domestic violence cases after revising its policy in August 2014 following the Ray Rice case, which could complicate any attempt by Manziel to return. The first agent, Erik Burkhardt, cut ties with Manziel after last season. Burkhardt's replacement, Drew Rosenhaus, dropped Manziel last week. His marketing agency dropped him before the charges were filed, and Nike confirmed last week that it no longer has an endorsement deal with Manziel. Crowley alleged that the 23-year-old quarterback accosted her at a Dallas hotel and later struck her when they drove back to her apartment in Fort Worth. She was granted a protective order that requires Manziel to not see her for two years, stay at least 500 feet from her home and place of work, and pay $12,000 in legal fees. Crowley alleged she and Manziel had a confrontation in the hotel room that eventually continued downstairs to the valet station. She said he forced her into a car and a valet disregarded her pleas for help. Dallas police said Feb. 5 that they were investigating the case, a day after they issued a statement saying they considered the case to be closed. In the wake of the allegations, Manziel's father said the family had made two recent, unsuccessful attempts to get him into a rehab clinic. Manziel - who entered the NFL with a reputation for partying and drinking - spent 73 days last winter in a Pennsylvania treatment center specializing in care for alcohol and drug dependency. Manziel was cleared of any wrongdoing last year after he and Crowley got into a heated roadside argument near his home. Witnesses to that incident saw Manziel arguing on the side of a highway with his girlfriend and pulling her back into his car as she tried to leave the vehicle. He was not arrested, and Crowley told police she didn't want to press charges.